If you look out the window right now and the building across the street is masked by a thick brown haze of pollution, then you might want to reconsider your vow to never EVER wear a ridiculous leopard print, fluffy face mask. It is well known that China’s biggest cities have poor air quality as a result of industrialization. Both vehicle traffic and factories emit particulate matter as well as a range of chemicals that can cause acute and chronic respiratory and cardiovascular diseases. According to the World Health Organization, every year it is estimated that ~800,000 deaths worldwide are caused by outdoor urban air pollution. Many scientific studies now provide evidence that high-efficiency face masks can actually improve cardiovascular health when exposed to poor air quality. However, this doesn’t include the typically-seen-in-China leopard print fluffy varieties or the surgical style masks that are only good for preventing the spread of colds. So if you decide your health is important or just want to look like Darth Vader, then here are a few pointers that may help you chose the right face mask. It is essential when purchasing a mask that you look carefully at its filtering ability. The main aspects for consideration are the type of pollution the filter is removing and how well it does this. There are two broad types of filters on the market: those that remove particulate matter (i.e. solid particles and water/oil based aerosols) and those that filter gases and vapors. Some combination filters have the capacity to filter both solid particles and specified gases. Research suggests it is the fine and ultra fine particles (PM <2.5) that can be dangerous to inhale as they can enter the bloodstream. 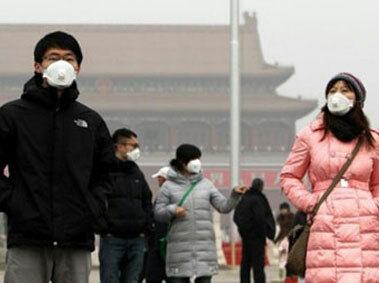 In fact, these fine particles are thought to have caused 8,572 deaths in Beijing, Shanghai, Guangzhou and Xi’an in 2012. Particle filters are classified by what proportion of these airborne particles are removed (e.g. 95%, 99%; see Filter Standards below). Whereas gas filters are usually classified by the type of chemicals that are filtered. For example, activated charcoal filters often marketed towards city commuters adsorb ozone but are not effective for carbon monoxide, oxides of nitrogen or hydrocarbons; all of which are emitted by vehicle exhausts (you would need a SCUBA tank strapped to your back to be completely protected from these substances). Understanding the technical jargon behind the standards applied to respirator masks can be a little difficult. European and American standards use terms such as protection factors FFP2 and N95, which basically just refer to the percentage of airborne particles that the mask can remove. European standards (EN143 and EN149) use FFP1, FFP2, and FFP3 which filter 80%, 94% and 99% of particles, respectively. Similarly, American standards use a slightly more intuitive set of codes, N95, N99 and N100. High numbered masks, such as N100 and FFP3, provide a greater level of protection but in some cases lower grade filters are sufficient (e.g. FFP2 for diesel fumes). When purchasing a face mask you will need to consider how often you will use it and for what activity, whether it be walking, cycling, sanding, painting etc. Comfort and adequate ventilation are important for example if you are commuting through the city on a bicycle every day. The filtering ability of some masks can limit your breathing capacity and the build up of condensation can be a problem. In this case you may also consider a reusable mask rather than single-use disposable masks, which would soon add up in cost as well as fill the rubbish bag. The most reliable single-use masks are produced by 3M and can cost around 230 RMB for a box of 10. They are approved to last for a single shift but this is entirely dependent on the level of contamination, humidity and heat levels, and your breathing rate. Reusable, washable masks range in style, filtering ability and certification but have the advantage of replacing only the filters. Note that some fabric masks incorporate the filter, so the entire mask would need replacing once the filtering ability has expired (vogmask.com). Two main brands of multi-use masks are Respro and Totobobo; the first are the Darth Vader kind and the second make you look somewhat like an extra-terrestrial. Totobobo masks cost around 25 USD and filters cost 19-28 USD depending on filtration factor. It is recommended to change filters either as they become discolored or within two weeks. Respro filters last longer, 4-6 weeks, but are more expensive with a two pack costing 140-400 RMB. The range of Respro masks is larger, although fairly unattractive, and cost 240-370 RMB (pollution-china.com). The most important aspect for the effective use of a face mask is ensuring it is well fitting. If there are gaps between the mask and your face then unfiltered air can be inhaled, reducing any associated health benefits of wearing a mask. Ensure the mask comes with an aluminum clip that can be adjusted over the nose or an adjustable mask that can be cut to fit. Filters will only be effective if replaced regularly so don’t try to save money by stretching out the usage time. This goes for both charcoal and particle filters. It’s likely that if you are getting stared at or laughed at you may not want to wear your mask in public. An option would be to wear stylish face cover (leopard print maybe?) over the mask as long as it doesn’t restrict airflow. Comfort is also a determining factor for wearing masks, especially in hotter climates or when exercising. So those cheap street-style masks in your local shop are not suitable for anything other than keeping your face warm in winter. Neither are surgical masks, which are only designed to prevent the spread of illnesses. Instead you may find masks able to filter 95% of airborne particles in some local hospital clinics and pharmacies (ask for a pollution mask, wuran kouzhao 污染口罩). Otherwise it is probably easier to order online and in bulk. The 3M website offers a range of locations (although not China, or the US) where their products can be purchased. Totobobo and Respro can be purchased from their respective websites and delivered in China; note however, that Totobobo masks do not comply with European or American standards. Alternatively, try amazon.cn or taobao (search a model number like “3M 8247 R95”). A word of warning on taobao – they do have fake masks so be sure to fully question the authenticity before buying. The Chinese government of course knows exactly who and what is causing the pollution. They cleaned up their act for the olympics so they know exactly how and what to do. When it comes to ur health, it doesn't matter if u're looking silly or not! They really look silly with the mask,what more about a 'laowai' wearing it.